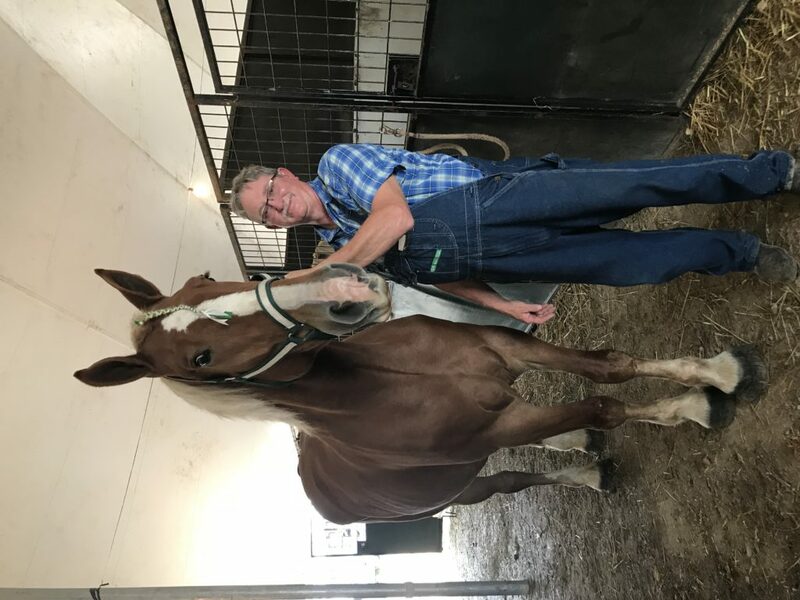 Barney Traylor stands with one of his Belgian horses at the Hillsdale County Fair. John Arnold | Col­legian. While most in the Hillsdale area sport pickup trucks or sen­sible Subarus, one Hillsdale couple opts for a dif­ferent style of trans­portation: a horse-drawn wagon. At least once a month, Barney and Teresa Traylor can be seen driving in downtown Hillsdale in a horse-drawn wagon, taking a break from the regular hustle and bustle of modern life. For the Traylors, horses are a long-time, simple con­stant in their life, and now they are able to share it with their com­munity by using their houses for events upon request. For the Traylors, the wagon outings are relaxing and, as Barney Traylor puts it, the horses are “an expensive hobby.” Some­times, other members of the Hillsdale com­munity will request the Traylors’ ser­vices, for wedding venues or holiday church events, birthdays, sleigh rides, or orga­nized fall outings. The couple has no desire to make money off of their passion. Barney Traylor said he doesn’t see his horses as a business as much as he sees himself as a business trying to sell a product; he enjoys the thrill of driving his horses into town, wife and grandkids in tow, so the town shouldn’t go without such an expe­rience at its own dis­posal. When the Traylors do find them­selves riding into town, they nor­mally stop at the McDonald’s drive thru, which is always a sur­prise for the employee working the drive thru that day. For the Traylors, the monthly expe­rience more than out­weighs the costs of their favorite pastime. 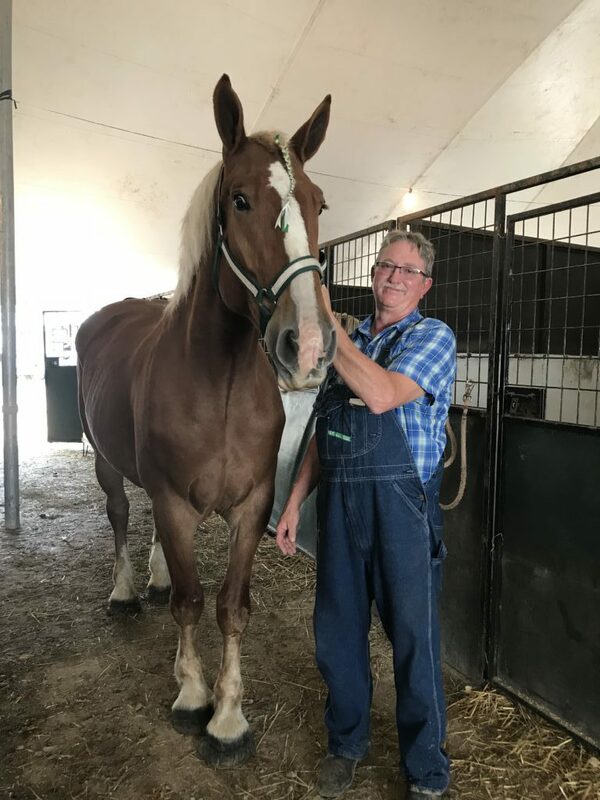 “The world slows down,” Teresa Traylor remarked with a smile, as Barney busied himself bathing two of their Bel­gians, Lily and Roxy, getting them ready for their show at the Hillsdale County Fair. Barney, the cus­todian at one of the Hillsdale local ele­mentary schools and Teresa, a bus driver in the school dis­trict, have been raising and training horses for the past 20 years in their family home just 10 minutes outside of Hillsdale. Teresa has grown up around horses all her life, and Barney said he has always been fas­ci­nated by them. In 1997, the couple pur­chased their first mare and began breeding Bel­gians in 1998. Since then, the Traylors’ stables have become the home of 14 stunning mares, and as Barney added jok­ingly, “We only ever seem to get the mares with blazing stripes,” pointing out the beau­tiful flashes of white that streak the heads of all their horses. The Traylors make the wagon rides into town whenever they can, but it can be dif­ficult at times. Barney has even taken his horses to the national level, becoming the U.S. National Plowing Cham­pions in Ken­tucky in 2016. The training also has its own prac­tical appli­ca­tions: some­times Barney will use his horses to plow his own fields. Beyond the occa­sional rides into town, the Traylors also train their horses for com­pe­ti­tions and shows, including com­pet­itive plowing. In the advent of tractor plowing, Barney said com­pet­itive horse plowing is like a “science” or “hidden knowledge.” Barney trains his horses in speed con­sis­tency, in their ability to maintain a steady trot, and in the orderly manner with which the horses pull the plows that till the ground. In accor­dance of the familial impact horses have had on their lives, Teresa plans on moving forward with getting their grand­children involved. The Traylor grand­children have begun to learn the ropes behind raising the horses. “We’re doing the grandkids thing now,” Teresa said, smiling.